There are a few things that have hindered my progress in tapestry weaving: my lack of sketching skills, and a variety of suitable weaving yarn. I’ve always felt I need a decent sized color palate, but perhaps it’s just me. 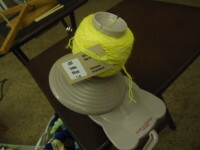 Last year I found an option I could afford – a yarn suitable for tapestry weaving. 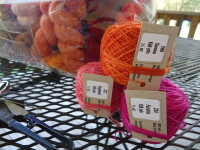 Timeless Textiles offers, Epic in one of each color in reasonable “put ups.” Late last year I ordered the Designers Pack of 20/2 – Epic Yarn, 114 colors, 150 yards 1/2 ounce put ups. 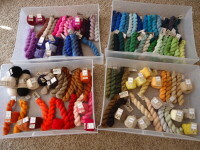 I started school in January, so I’ve had little time to weave or organize all this yarn. 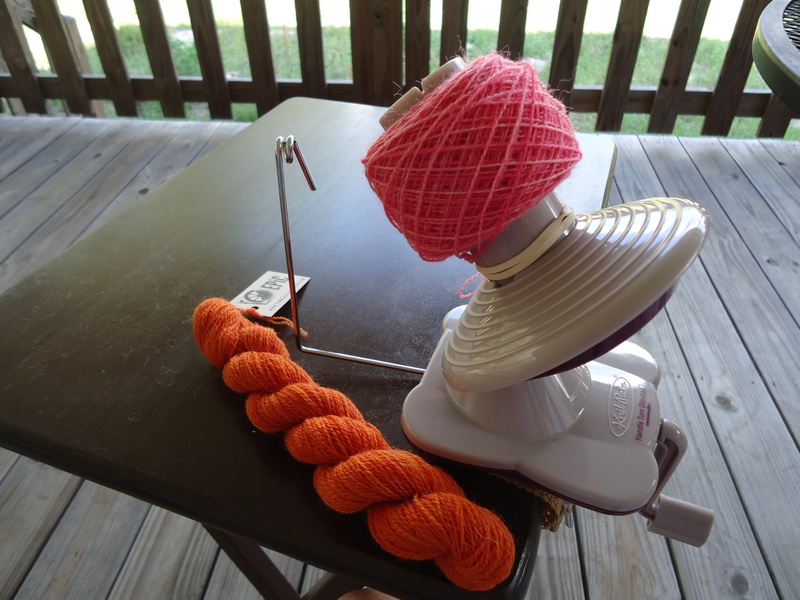 I’ve decided it’s best to wind the skeins of yarn into center-pull-balls now, as this is something I’m likely to put off when I’m ready to weave. 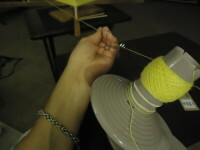 I hope my ball winder is up to the task, so far it’s faring well. It’ll take me some time to wind all 114 skeins into balls, especially since I’m only doing a few at a time in the evening. Luckily there’s been a couple of pretty days to do it outside when I have breaks from school-work. 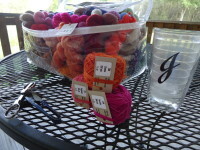 I’ve decided to organize the yarn by color family and color number. 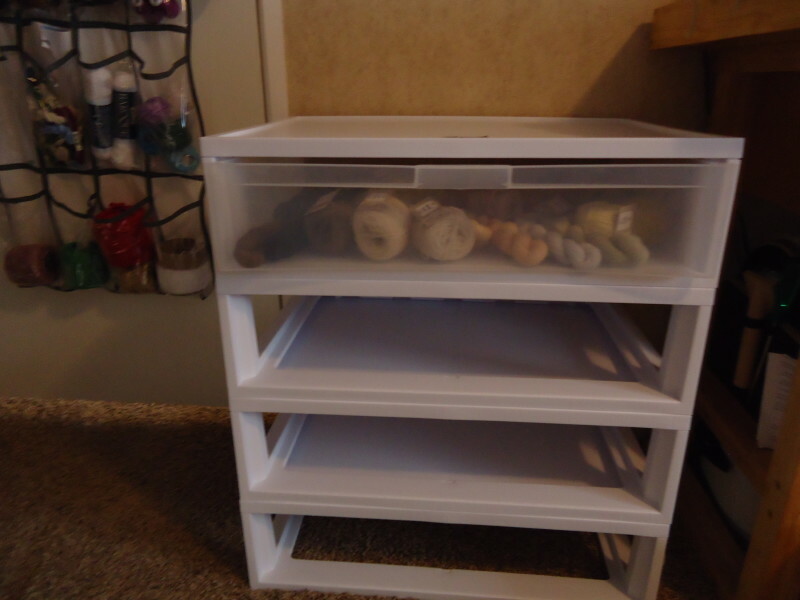 I first separated the color families by sight, then organized by number, and divided the yarn by the four drawers I have. 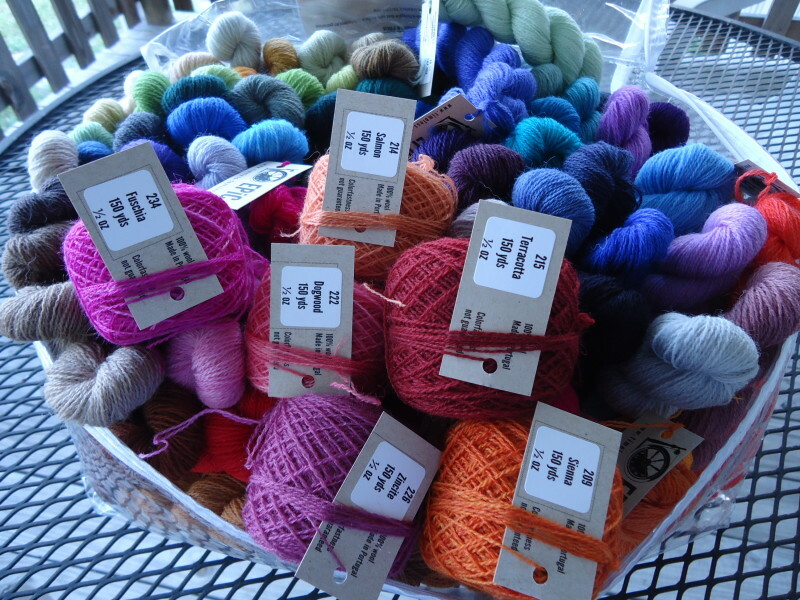 As I acquire more yarn, I’ll rearrange the yarn in an attempt to keep color families together without crowding. 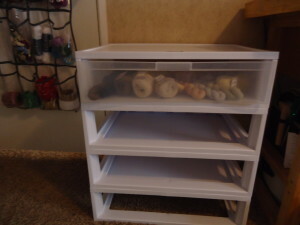 I want to open a drawer and see the colors easily without digging, so these shallow drawers seem perfect for the task. I’m left with improving my sketching skills and working on more projects to improve my tapestry weaving techniques – and weaving to create and enjoy. I would like to have a tapestry project to work on this Summer. I bought a book that claims, sketching is a skill that can be learned, as opposed to a talent one must be born with (Drawing on the Right Side of The Brain, Betty Edwards). I have limited time to read and work through it, but it’s a priority on my free time. I’ve also found myself the recipient of the workbook that accompanies this book, and a companion book, thank you, Dear Friend. When I take an inventory of the people in my life, I realize what a blessed life I live. Now, if I could find a place that has Time for sale, I’ll be all set. I just started learning how to weave and I’ve been wanting to weave a rug but I’m not sure how to go about doing it. What is the best yarn to use? I was also wondering when you’re done with one color of yarn do you just tie a knot with the other color of yarn? Hi Zoe, I’ll try to answer your questions to the best of my ability. First, for rug weaving, I’ll assume you’re interested in Navajo style weaving. One of the most popular weft yarns for Navajo style weaving is either homespun and dyed singles yarn and/or Lambs Pride yarn from the Brown Sheep company. They use a wool warp, as well. Furthermore, it’s important to know in Navajo Style weaving, yarn isn’t cut, rather it’s grasped firmly at both sides at the point you want it to break, twisted and pulled so the yarn drafts apart – leaving a tapered and wispy end. When starting a new yarn or changing color, the old yarn is laid in the shed, then the new one is laid on on top, with only the tapered wispy ends overlapping. The wefts are beaten in place, and they never poke out or come “undone”. A great book for Navajo style weaving is, Navajo Weaving Way The Path from Fleece to Rug by Noel Bennett and Tiana Bighorse. There are others, but I would choose this for my first book. A workshop would be most helpful. There are two knots in Navajo weaving. One knot at the beginning of the warp, and one at the end. The only other knots are in case a warp breaks. The wefts are never tied. If you’re interested in tapestry weaving, then the world is your oyster. 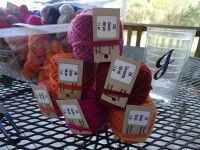 There are a wide variety of yarns that work well. 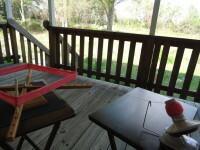 Warp yarns are most commonly cotton seine twine, linen and some use wool. Weft yarns are most commonly wool, any firm, worsted-spun wool yarn that packs well and isn’t lofty or “spongy”. They generally feel scratchy to the skin. However, many weavers combine wool, silk, bamboo yarns, ramie, cotton, and linen. The Epic yarn from Timeless Textiles is good, the yarn that Norsk Fjord Fibers sells is a superior yarn with a phenomenal color selection, and the yarn that Between and etc. 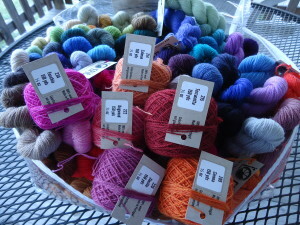 sells is also a great yarn – just for starters. Tapestry weavers will sometimes lay they’re wefts in for color changes as the Navajo, but many will start and finish wefts with a half-hitch, leaving the tail on the back of the work. A great book for European tapestry weaving is Tapestry Weaving – A Comprehensive Study Guide by Nancy Harvey. The study of these weaving disciplines can easily span a lifetime. There are both, similarities and differences between the techniques and philosophies of these wonderful weaving traditions, and you will find strong opinions for each. My advice is to, buy the materials that work well for you, buy the tools that speak to you and feel good in your hand, use the techniques that give you the results you seek, and enjoy your craft. As a side note: Nancy Harvey has some older dvds available on tapestry weaving from The Yarn Barn of Kansas.